Showing results for tags 'vintage jeep'. Ok, got my subscriber membership now. So, after not doing much with the jeep the past couple winters due to my snowbike hobby I jumped back in yesterday. I have to reassemble the front axle and clean the rear axle housing. I ran into trouble with the new front wheel studs that came with my new wheel bearing hubs. There is a shoulder behind the knurled section that would not allow proper press-on fit. The jeep parts vendor sold me the wrong studs it appears. Napa was able to look up studs for a scout and I was able to look at one to confirm it will work. A second problem I found was my new rotors that I purchased almost 3 years ago. I went to test fit one and found that the hub hole is too small, under 4” and it needs to be over 4”. They are for a 81-86 CJ. I’m guessing I need mid-70’s. 1963 Jeep Gladiator J-Truck 4x4—Collectible? Hello fellow jeepers, I'm new to the forum and wanted to share my current project. I have an old flat fender that's been in the family for around 30 years that was in dire need of restoration. It's turned into a ground up, the frame was twisted and severed in the middle and the tub was all rusted out. I completely rebuilt the frame, straightened it all out and reinforced the weak areas. I didn't box the frame as I want to retain some flex. I did some extensive panel replacing and patching on the tub and built new floor pans for the front and rear. The axles are stock D44 rear and a custom built super 44 up front. I still have the Dana 18 tore apart, but ready for assembly. I had to find a shop that could replace and fit a new bushing for the output shaft. Other than that it's getting a full rebuild kit. 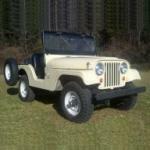 The Jeep has a T19 from an IH, it is still in great shape and will only get a small parts kit. The engine that was in it was a tired 225 with a cracked block. I got a couple other oddfires when I bought the Jeep and decided to rebuild another 225. After going through the cleaning machine, my machinist found some deep pitting in some of the cylinders. The block was already .030 and with advice from TA Performance we took it to .070 and they ordered me some .020 Buick 350 pistons from Egge. Apparently they have seen a 225 bored .090 over without structural or cooling issues. Once I had those my shop sent everything in for a full balance. They refreshed the heads with new springs, exhaust valves+hardened seats, valve job,and new seals. I did some minor porting and cleaned up the runners to smooth the air flow. It's not a race engine but even the small improvements go a long ways. I still need to port match the heads in addition to the offy intake and the headers. I had Delta cam in Tacoma build a strong low-end torque cam. I was searching for some info last night, do you know what the combustion chamber size is on the 225 heads? Egge couldn't tell me what to expect for static c.r. That's probably enough for now. I'll post pictures in the days to come.